Puget Sound's narrowest passage is a scenic place where tides rush through two channels between the cliffs of three islands. This is Deception Pass, a gate allowing the passage of salmon, sea lions, and whales; blocking storm swells and tsunamis that come rolling from the open Pacific through the Straits of Juan de Fuca. The passage is rocky cliffs and swirling sea, treacherous whirlpools amid swift currents of cold waters, waters that flow south from Alaska. The clifftops are linked by a pair of narrow 80-year-old bridges supporting a highway almost 200 feet above the water. According to local lore, Captain Cook named this passage Deception Pass in 1792. He thought the impressive westward rushing water was the gush of a great river, the river he aspired to find: the Northwest Passage. But he soon discovered that current was a mere outgoing tide: the westward flowing waters of Puget Sound. Waters that rush out to west, then stop, and then rush to the east. 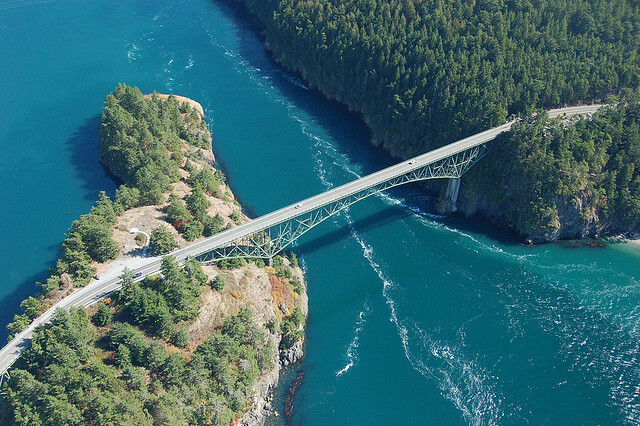 Deception Pass is the heart of Washington's most popular state park. The waters are a destination for fishermen and sea kayakers, the bridges for photographers and sight-seers, the cliffs for birds. The rocks are too brittle and crumbly for humans to climb. It is a lovely place: beautiful, dangerous. If you stand on a bridge and look down you will see green water. Usually the tide will be running and you will see all the features of a huge river: swirly eddy lines, whirlpools where the water goes deep, huge boils where it burbles up to the surface. If the tide is going out, flowing west, and a gale force wind is blowing in from the Pacific, you will see huge standing waves. In mild conditions these waters are fun surf spots for kayakers. In a storm the waves become ship-sinking monsters. If you attempt to boldly chug through the pass in stormy conditions the waves will capsize your splendid yacht, your grungy old tugboat, your canoe, whatever you have. People will stop on the bridge to watch the tragedy unfold and call for help, but no one will come to your rescue because no one can. When the water calms, no one will dive down in search of your corpse, either. Deep currents in the pass make diving extremely treacherous, and they carry the dead away. Nothing that water can move stays in the pass, and this water can move almost anything. Searching for the dead has been strictly a surface affair here since the summer of 1970, when several divers perished trying to retrieve a small plane full of people whose daredevil pilot illegally flew under the bridge, then zoomed up and hit the power lines that cross east of the bridge, from hilltop to hilltop. The plane exploded. Divers trying to recover the bodies were swept away by the currents and died, disappeared. Whatever remained intact is still there: airplane debris amid the ships' wreckage on the bottom. These days if someone goes missing Coast Guard helicopters fly search patterns day and night and rescue boats putter along to scan the water, but nobody dives for bodies. You need to wear a good 'Personal Flotation Devise', a PFD, if you want your corpse to be found. Otherwise, the currents in those whirlpools will take you down to feed the crabs. Puget Sound is home to a large, beautiful, abundant, and delicious species of crustacean: the Dungeness. We like to eat them. They like to to eat us. Bodies without PFDs are usually never seen again, though remains are sometimes found. Sometimes they wash ashore miles away, days later. If someone is lost, the locals might go to check the tidal debris on their own beaches – or not, depending on their inclinations. Personally, I avoid the beach if a body's due to wash in. Let someone else find that. These waters are most dangerous to people who visit from some other place and don't understand how much this is not like a lake. Years ago, some guy from the Midwest walked out on the bridge on a warm summer day, there are sidewalks on both sides of the highway. He asked why no one was diving in. He was told nobody swims here, the bridge is too high for diving, the current is too treacherous, the water is too cold, and how would you get out, climb a cliff? He said you people are weenies, and did a swan dive. Everyone was amazed to see him regain the surface. He survived the jump and tried to catch his breath, but the tide was running. A whirlpool immediately pulled him down again, and he was gone forever. Never found. People from the Midwest don't know where they are. They think this is a big jolly lake like the one they enjoyed back home. They're prone to going out in canoes. But they do everything the opposite of sea kayakers: they only take one boat, they can't right it when the current flips it, and they are not prepared to swim. They don't wear a drysuit, a wetsuit, a helmet. Unlike lakes in the Midwest, which have layers of warm surface water in the summer, tidal currents here continually mix the full column of water. It's about 48˚Fahrenheit at all depths, in the summer, winter, fall, and spring. It's so cold half the people who drown here experience cold shock when they fall in and never return to the surface. You can't actively swim in water this cold for five minutes without a wetsuit or drysuit – you'll be overwhelmed, effectively paralyzed, by hypothermia. The Coast Guard can find capsized canoes and PFDs. Coast Guard rescue swimmers are prepared to leap from helicopters in dry suits to defy seemingly impossible conditions and save a helplessly cold or unconscious person, but Midwestern canoers don't even wear PFDs. If they take one along, it's usually found empty: uselessly tied to the boat, or floating free. During the Depression, in the 1930s, when the bridges were built, the men of the Civilian Conservation Corps, the CCC, constructed picturesque log-and-granite buildings in the park, with matching log-and-granite barriers between the road and the cliffs on the approaches to the bridges. The logs were made of big Douglas fir trees. Those logs are gone, replaced by more serious new barriers that meet modern standards, because an accident proved the need. One summer night in the late '90s, a pair of local girls were distraught about the car accident that killed their best friend the day before. Maybe it was their fault she died. Maybe it was hers. They got drunk. After midnight they drove to the pass, intending to do who-knows-what, but the intoxicated driver went too fast, lost control, and crashed into the old log barrier at the top of the cliff, beside the bridge. The log crumbled. The car kept going. The girl in the passenger seat flung her door open and jumped out as the car went over the edge. She somehow clung to the rocks and crawled, climbed, back to the road, where she sat in the gravel, a bloody mess crying in the dark. The car hit a tree, halfway down the cliff, and hung there, suspended. The driver fell out and landed in the water. She didn't want to die, so she struggled to keep her head up even though she was drunk and had a broken leg and ribs, but of course the water was deadly cold and the current had her, so really, there was no hope. The next car to approach the bridge was driven by a Coast Guard rescue swimmer, on his way home to Whidbey Island from somewhere. He saw a bloody teenager sitting next to the road beside a broken barrier and stopped to help. He looked over the edge and saw the lights of the car in the tree. Then he heard the other girl splashing down in the water, in the pass, and he somehow – no one knows how, he must have used magic, it was miraculous, no one ever attempted such a thing before or since, it's hard to imagine, it's unbelievable, no one in their right mind would even rapel down those cliffs, everyone knows what he did can't be done, but it was done, so all the locals had to go look at the splintered barrier and the cliff and the tree and the water, and crowd around arguing about God and physics, and gawking in awe at the marvelous impossibility of this – he flew down that 200 foot cliff in the dark, swam in the pass with no wetsuit, no drysuit, no light, nothing, got hold of the injured girl, defied the current, and brought her ashore. No one could reach them from land, he had to hold her on the rocks and keep her alive until they could be rescued by boat, and then flown to the hospital in Seattle, hours later. He saved that girl's life, and made it possible for her to grow up and stop acting like such an idiot. And that, really, is the best thing that ever happened at Deception Pass. Susan Brown’s grandfather worked at Deception Pass with the CCC in the 1930s and returned to live near the pass in the early 1950s. Members of the family have lived near the pass ever since then. Ms Brown grew up there but also spends time in many other areas, especially Seattle. She finished her MFA in Creative Writing & Poetics at the University of Washington-Bothell in 2014. Photograph courtesy of Washington State Dept of Transportation under a CC BY-NC-ND 2.0 license.